We study a hybrid system composed of a three-level atomic ensemble inside an optomechanical cavity. The mechanical oscillator is coupled to the internal state of the atomic ensemble via electromagnetically induced transparency (EIT), created by the intra-cavity field and an off-resonance control laser. The fluctuation in the output-coupled cavity field is fed back to the mechanical oscillator. We use a combination of feedback and EIT-assisted cooling of the oscillator to its quantum ground state and then establish coherent coupling between the oscillator and the atomic spin. The superposition of the atomic state and oscillator is studied in different regimes of optomechanical and light–atom coupling strengths and the conditions for creating a single atom-phonon polaron is identified. 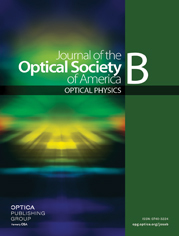 We observe coherent superposition of fluctuations in a range of optomechanical and atomic cooperativities.